Bulk SMS services are just like a magic wand, which has taken the mobile communication to an unprecedented level and has made it far more effective than ever before. This has resulted in creating a hard-hitting revolution in the world of mass communication. As a result of the avant-garde technological advancements and the fast enhancing accessibility of mobile phones, sending bulk SMS seems the easiest and the fastest way to reach the target audience within the means of the customers. 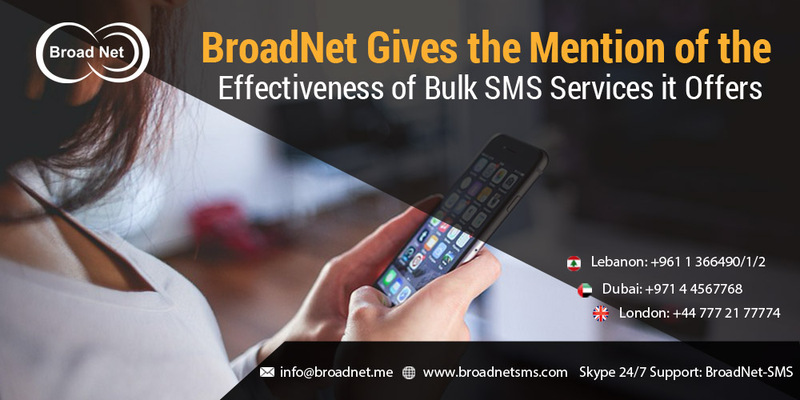 BroadNet is the industry’s smashing and leading SMS marketing service provider and through our world-class and sumptuous bulk SMS services, we help our customers to stay in touch with their target audience very fast and in the easiest way. We help you to create a sensation of your brand in the market. Also, we help to make your hard-hitting SMS campaign a real smasher with our state-of-the-art SMS marketing services. As a matter of fact, the initiative of sending bulk SMS is becoming more and more popular with each passing day. Bulk SMS services are the ticket to send tips, service messages, alerts, reminders and other types of communication to the customers across a broad geographical area. We use state-of-the-art Bulk SMS software that is hassle-free to use. An SMS plug-in can be installed on your Microsoft Excel sheet and this way, you can send SMS right from your computer. Bulk SMS marketing services are coming to the front rapidly because of its hassle-free accessibility to every length and breadth of the globe. We just want to ensure you that you are only a click away from your target customers all because of using the advanced communication tools. We have superior SMS servers that are capable of holding out massive loads and therefore your SMS never conks out because of a busy server, which facilitates you to send bulk SMS simultaneously with ease. At BroadNet, our policies are all the way see-through and our services are effective enough to meet the different needs of our customers. Our Bulk SMS software is designed to deal with database easier and ensures better productivity after the incorporation of our bulk SMS into your corporate culture. No matter wherever your customers are in the world, our services carry your messages to them. We offer the widest coverage and are the most sought-after service providers for SMS marketing.